You're obviously correct saying the EV line doesn't show what we "deserve" to win, but it's a much better estimative to a "real" winrate (which always changes because opponents change and so does our game - but you get what I mean) than the green line. 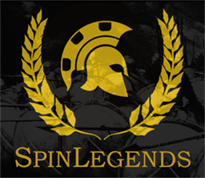 It accounts for the luck factor better than in cash games because we get it in preflop or on the flop most of the time in sngs, so the situation you described happens much less often than in a cash game. Most of the time we're all in, we simply shoved preflop. Nevertheless, I agree that one should check the red line mostly for curiosity or not at all. You can't buy stuff with it, and it doens't mean you'll run better or worse in the future, so all there is to be done is keep working on playing well and improving. well the red-line is a better indication of your real roi than the green. yes there are a lot more factors (card removal, set-ups etc..) but at least this takes out a significant portion of the luck-factor to help give a better indication of real rois. i think a 6k sample is definitely more than 250k hands. i think it might be 350k in average (for 9mans)? (not sure though didnt check this). at least this way tim can post his lolbad graphs, and we can reassure him that everything will be ok. without the red-line Tim would quit poker because it doesnt look very promising. some people will benefit by looking at it, some people wont. i went through a month of not looking at it. i was a much happier grinder. Thanks everyone for the encouraging posts - and, TT, for benefit of your wisdom. I think as has been mentioned, setups are a much smaller factor in SnGs where average stacks are perhaps 20-40bb deep. edit: just hit 90 BI below EV. FML. If it gets to 100, I'm donating $20 a friend's charity. Hit 103.31 BI below EV this morning. $20 donation made to The George Oliver Foundation, a friend's charity, which was set up to help children in various different ways. I'm going to try to draw a line under this topic now. Next post will not mention running bad. I promise. As for the EV-line, it has many flaws but it can be a comforting thought when that's in big plus in a down. So, subscribed to your blog. And don't worry, there will be just one good session and you'll be out of this hole in no time. And after this, a 40BI down will be so easy to take mentally, you will profit much from this when it's over. Next post will not mention running bad. I promise. 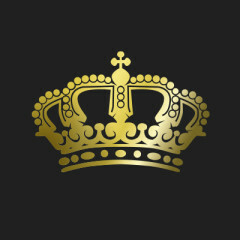 This post has been edited 2 time(s), it was last edited by Tim64: 28.08.2011 22:17. 67/33, 12hands. Wondering if there is a more +EV play. 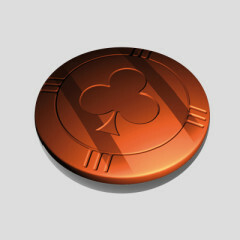 Preflop raise deliberatly sized as villain has no fold button. This post has been edited 1 time(s), it was last edited by Tim64: 26.02.2016 17:15. So I am giving myself six months to turn things around (or, depending on how you look at things, to continue my progress) and after that I will call the clock on myself. I really need to make a consistently decent hourly wage of $15+ over that period otherwise there is just no point continuing. More importantly, I'm going to set myself reasonable goals, keep healthy and fitter and be a better husband. So, total earnings for the first half of the year were: $4909.85, while total earnings for the second half of the year were: $10,393.96. Total time spent for the second six months were: 675.12 hours, giving an hourly rate of: $15.395. (6000 SnGs, mostly FR/6mx, from $5.5 or so up to $60). 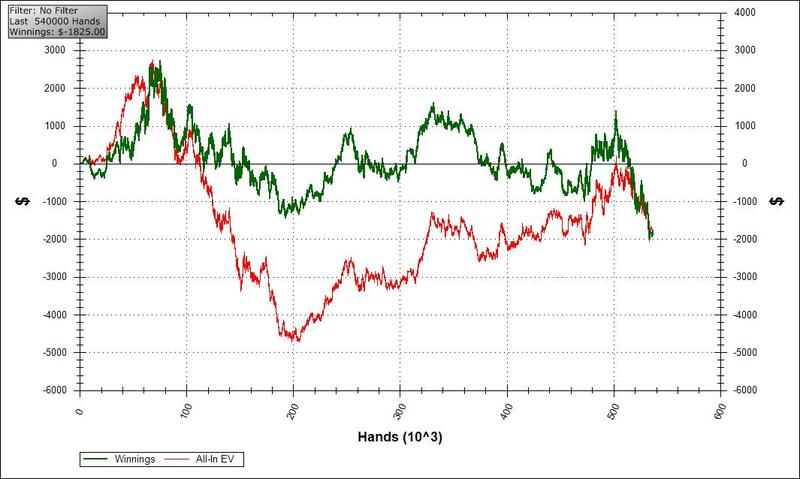 The SNG graph gives me a lot of confidence that, beyond any shadow of a doubt, I'm a comfortably winning player. Therefore, there is no reason why I can't make a living in the medium term playing poker. So the key issues going forward are i) whether I can move my earnings into the next bracket (realistically, I guess, $30k p.a. ); and ii) whether this type of life is really what I want. The Full Tilt debacle has been something of an eye-opener. A career in poker is not without risk (even disregarding the psychological trauma of long periods of running badly, which it's clear are an inevitable part of the job description). 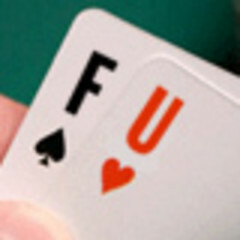 I don't think I will ever fully trust a poker site again. That doesn't necessarily matter so long as I can mitigate my risk, but it does give me pause about the nature of the industry in which I find myself engaged. Notwithstanding these reservations I can't stress how important it is to me to have found a way to support my family which does not require me to go out to work in the normal fashion, nor put me at the mercy of an employer. To all intents and purposes I am self-employed, plying my trade on the electronic highway. Yesterday we drove home in the morning from a friend's house where we had stayed overnight, having spent the previous day eating and drinking and making merry. I was meant to be working on Monday, but in the morning I decided to take the day off so we could enjoy the day properly and just work on Wednesday instead. I was struck by the wonderful freedom implicit in being able to make that decision without needing anyone's permission. Furthermore, the sight of people hurrying to work the following morning to their various office jobs represented something that, for good or evil, I am in no hurry to return to. In my own way I am now shackled to poker as a means of making a living. But somehow the fact that I've chosen to wrap myself in these particular chains makes me feel like an occupant in an open prison, where an inmate may come and go as he pleases. *The figure for June is the EV profit for that month, including rakeback. I believe that's reasonable since, over an 6K game sample, my actual and EV $won are almost identical. **The figure for July includes earned (but not received) rakeback but is the actual rather than EV figure. 1)Where is shown in the graph the big swing that you are facing now? 2)Is it worth keep playing rather working in your opinion?I mean do you want to take a risk that the online poker will be legal and tax free in europe? 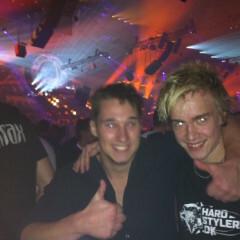 This post has been edited 1 time(s), it was last edited by Demonic226: 31.08.2011 16:59. Very nice post Tim. It's good that you made a review for yourself of the past half a year where you decided to go pro. I totally agree with your reasoning of being and staying a pro (as I think most do), this is exactly the reason why I decided to go (semi)pro as well last August. I'm still studying so I can't put all my effort into poker, but I still play 1-1.5k games a month. My situation is of course very different from yours as I'll probably have less expenses, but still I have to pay rent etc as well. Anyway, I think it's a good thing to keep reminding yourself during this harder times why you decided to go pro as well. I, myself feel exactly the same way when I see friends leave to work in the morning and I can just take the day off or start a bit later after a party. My big decision will come when I finish my Master degree, which is next year, if I want to go full time pro or not. A kind of hard thing for me will be to convince my family that I want to do it, because they are okay with the current situation but my mom keeps talking about a job after I finished my degree.. I know it's a lot of rambling and maybe you don't even care about it, but I thought it would be nice to share. 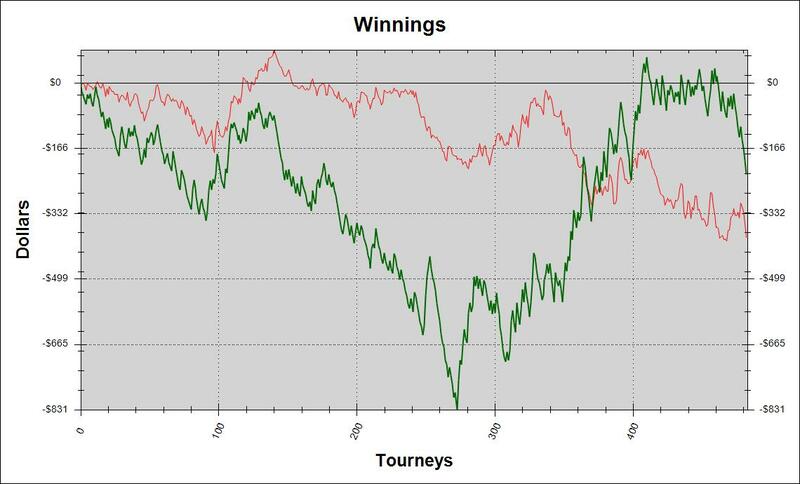 Btw does that SNG graph include your recent games at party as well? Very nice post and a very useful read. I like how you point out why you do this for a living, even though some not so good things comes with doing it for a living. 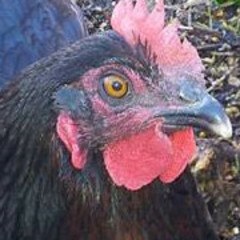 This post has been edited 1 time(s), it was last edited by Tim64: 31.08.2011 18:13. No, graph is just for games on Full Tilt. I will post Party graph of hell after month end. Always nice to read of others' exploits and feelings. congratulations tim. you know what they say with any new business. making it through the first year is the hardest part. This post has been edited 3 time(s), it was last edited by Tim64: 26.02.2016 17:19. As you can see, I ran the best part of $2000 below EV. However I mustn't allow myself the luxury of a selective memory. Three months ago I ran 70 BI above EV and made over $4K as a result so it's not reasonable to expect to avoid the flip side. 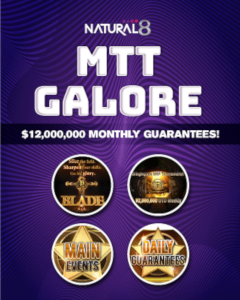 Nothing about this month suggests that I can't continue to make money on Party Poker, so the plan is to stay there at the very least until I have earned and cleared a $3K bonus. 1. omit super turbos from my game selection. 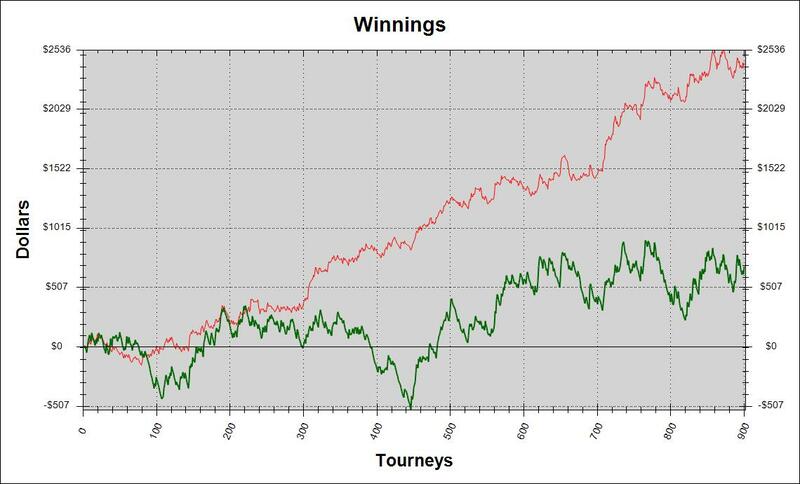 Here's the graph of the 500 super turbos I played the previous month (July), with average buyin of $20. I know it's only a small sample and yadda yadda ya, but realistically I'm not going to be able to turn -3.9% ROI into anything very profitable even if I was willing to stick with it long enough to find out what my real ROI was. Everything I've seen or read suggests super turbos are (a) highly variance rich and (b) have lower average returns. They are great for rakeback but I think for my mindset, they are not the right game. I had a long discussion with <3 yesterday about the pros and cons of these games as opposed to double or nothings. He made some very convincing arguments for steering clear of double or nothings, but I don't think I can be persuaded to reincorporate super turbos. It's a balance thing. I might conceivably be able to have a higher $/hr playing super turbos (either exclusively or as part of my sets), but I enjoy the post flop game and it's one of the things that makes grinding out a living playing poker relatively rewarding for me. Because of that, it makes sense that in terms of enjoyment, the tournaments I prefer are: 6 max > Full ring > Turbos > Super Turbos. I.e. my level of enjoyment is directly proportional to the number of flops I see and the number of post-flop decisions I get to make. 2. acquisition of new monitor allowing an additional 2-3 games per set. Over time I think this will demonstrate a clear increase in $/hr. It's too early to estimate what this will be or how much effect it will have on average returns. 3. using Table Ninja for Party. The program is a long way from perfect, in particular tournament (pot) betting doesn't work at all. Supposedly TN people are working on it, but either way it's more comfortable playing with a poorly performing Table Ninja than without it, so I went ahead and shelled out $60 this morning for a full licence. 4. incorporating $55s into my sets. I want to do everything I can to increase my dollars per hour and clearly increasing average buyin is one of the key elements of that strategy. In truth I'm not technically bankrolled for these games (with only around 50BI) in terms of my online 'roll. However since FT my attitude to bankroll has changed somewhat since there is clearly some risk to having a lot of money online. Now that I consider myself as being committed to poker long-term as a business venture, the strict distinction between poker money and real-life money is less important. (By which I mean that either the family has money to live comfortably and stay in business -- i.e. poker -- or we don't. The location of the money is largely irrelevant). Apologies for the recent flurry of posts; I'm trying to set out my stall for the year ahead so that I can crack on with the grind with a clear head. I've spent the day updating the document I created a year ago, which set out the assumptions I had made for the purposes of deciding whether or not to go pro. I've been very honest with myself about my experience of my first year as a professional and the ways in which it has been less satisfactory than hoped. To summarise, total earnings of around $15,000 for the year ($5000 of which are gone forever if Full Tilt does not return) are objectively very low for someone of my education/intelligence in the UK. There is no way of getting round that or dressing it up nicely. Furthermore, these earnings were not sufficient to support my family, so we have had to subsidise our income with savings. 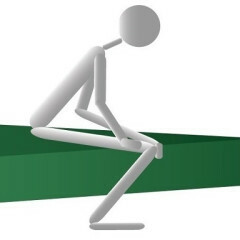 Moreover, the number of hours spent earning that modest amount was far in excess of what I had anticipated (i.e. my $/hour turned out to be much lower than I had assumed, meaning I had to work much harder than I had expected). Finally, and as a result of these factors, my health has not recovered as well as I had hoped (from when I was in a lot of pain around March of last year), and I have had much less time for other interests than I had expected. I've probably read three books in the last year, and that's pretty shameful for someone for whom reading is a real pleasure. I wanted to take some time to find out how things can be improved so that this next year is a more enjoyable and rewarding experience. 36 is still young enough to be active, fit and getting the most out of life rather than shut up staring at a computer screen for 70 hours a week. Over the next year I want to make $24,000 in EV earnings (including rakeback). I know that monetary targets are dangerous in poker but at the end of the day I can't simply say "I'm going to work on my game and hope the money comes". I'm confident enough that the red line for SNGs represents a realistic indication of earning potential (given a decent sample size) for that to be a useful measure of profitability. 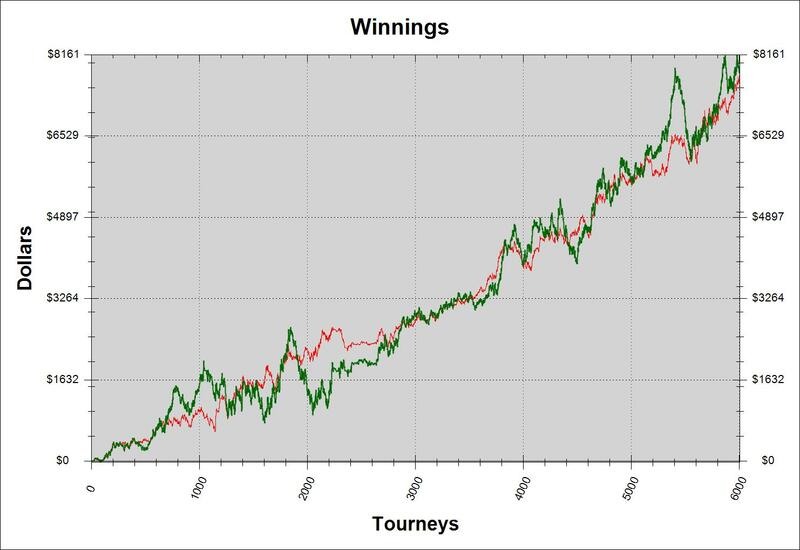 I don't think the figure quoted is too unreasonable, since it represents 1000 tournaments per month at an average profit of $2 per game, which my results - since I returned to tournaments - seem to support as a viable win rate. And I think that if I can't get very close to that sort of figure then it's time to hang up my shuffling gloves and find something else to do. I'm also hoping that one of the benefits of having an annual rather than a monthly target is that I will be less bothered about my short-term results (which hopefully should improve my overall mindset and level of contentment). If I can reduce the amount of time I spend in front of the computer, there is no reason why I can't get properly fit and begin to engage in some form of group physical exercise. I used to play hockey and occasionally squash. And somewhere in the storeroom there is a bicycle which looks at me plaintively from time to time. There are acres of beautiful countryside right outside the door that I rarely interact with. And I have a young daughter who likes to go swimming but whose father doesn't take her because he's always making excuses. I want the game to work for me, not the other way round. OH MY GOOd, U played hockey as well? Do u mean ice-hockey or some kind of wierd abomination hockey? anyway, Tim I am sure you can make more than 24k/year with the skills you have and the stakes u play now / will move up later. Also I think you will add more tables and become at least 12 tabling crusher who will be selected by all players who have just a lil bit of brain . I just regret I didn't have enough balls/ be like you and got stuck at the micros. But that's gonna change. Btw. I still owe you 1 hr. This post has been edited 1 time(s), it was last edited by Tim64: 01.09.2011 21:08.
p.s. thanks, Bobo and others for the encouragement.